From the outside looking in, many experts will consider Burnley’s eight-point advantage over Cardiff City to be unassailable. Many pundits have suggested that the Clarets are now safe following a 3-1 win over AFC Bournemouth at the Vitality Stadium. And some bookmakers have priced Sean Dyche’s side as short as 1/100 to beat the drop. However, regardless of heavy favouritism in their battle for Premier League survival, Ben Mee has vowed that the squad won’t be taking their foot off the pedal any time soon. “It’s a good cushion to have,” said the centre back. “We’re going into a big game at the weekend full of confidence on the back of two wins, coming to a place like Bournemouth, having beaten a team like Wolves. 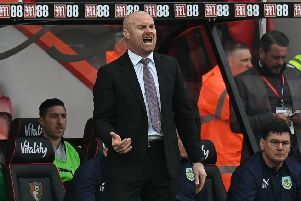 Avoiding defeat against the Bluebirds at Turf Moor tomorrow would see the Clarets take another huge step towards securing their status in the top flight for a third season in succession. Victory against Neil Warnock’s men would all but guarantee safety, leaving them 11 clear of the drop zone, and Cardiff with five games in which to overhaul them. “Hopefully we can get it done,” said the 29-year-old. “It was a big game for us next, regardless of what the result was against Bournemouth. “We’re going into it with that cushion, that confidence and belief. “We’ll go and take the game to them. “That Premier League experience helps. “We’ve got a good mentality within the group. While the Clarets enjoyed something of a renaissance over the second half of the season, clocking up 24 points from 14 games, Mee recognised just how valuable Dwight McNeil’s inclusion proved to be. The teenager, who has three goals and four assists in 16 appearances, was involved in Burnley’s second goal on the south coast, supplying the cross that was only half-cleared by Chris Mepham at the near post. Mee said: “I can’t praise him highly enough. He’s come in and done a really good job. He’s very mature for his age and he’s got a fantastic future ahead of him. “We don’t want to put too much pressure on him but he’s got that balance, that bit of quality and he’s added a huge amount to our team. “He’s creating goals, he’s scoring goals, so he’s doing his job really well. He’s got a mature head on him offensively and defensively, working really hard for the team. He’s enjoying his football at the minute and that’s the main thing. “He’s a tricky lad, he’s skilful, he has good body movement and can shift a ball really well. We haven’t had too many young lads in and around the squad in recent years.